Live chat software is a handy HR tool. Not only does it allow you to make smarter hires with speed, it’s also a great way to support existing employees. Here’s how WhosOn can help your human resources function thrive. You want to give candidates the best online experience possible. The easier your website is to navigate, the more information the candidate has, and the stronger your service – the likelier that candidate is to apply. And that’s where live chat becomes invaluable. With it, you have the perfect tool to engage, assist and advise. You can answer questions about roles, help with lengthy application forms, and provide quality consultant expertise while the candidate is still live onsite. Ordinarily, candidates interested in a vacancy have two options: they can apply immediately, or spend time contacting you via call or email to gather more information. They often have to take these efforts without yet knowing whether the role is suitable. Adding live software to your website removes that problem. 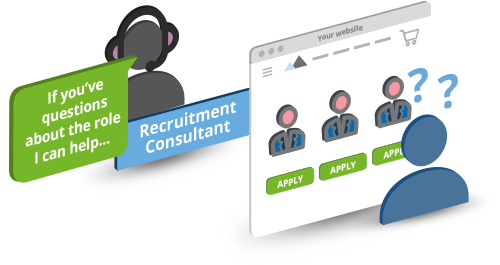 A low-barrier communication channel, it allows candidates to ask quick qualifying questions about a role before applying. That means less wasted time for job-hunters, less irrelevant applications for you. 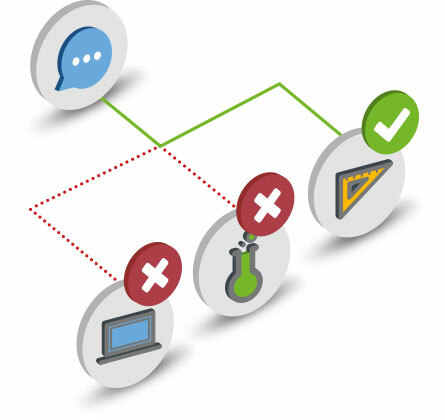 Live chat software automatically routes candidates to the relevant recruiter. Whilst viewing a role, the jobhunter can use a pre-chat survey form to select who they wish to speak to – whether it’s a recruiter listed in the ad or a sector-specific team. Once they’ve clicked to make their selection, they’ll be connected to the person best placed to assist. There are no delays, no messy transfers and no complex phone-tree menus: just instant expertise, for an instantly strong first impression. Candidates typically have to use multiple channels to apply for a role. After starting their journey online, there are separate emails to send, cover letters to attach, and phone calls to make and take. That’s not the case with live chat software. Chat allows you to share documents back and forth in real-time, without leaving the chat window. Application forms can be sent, and CVs shared discreetly (without uploading to a job board). 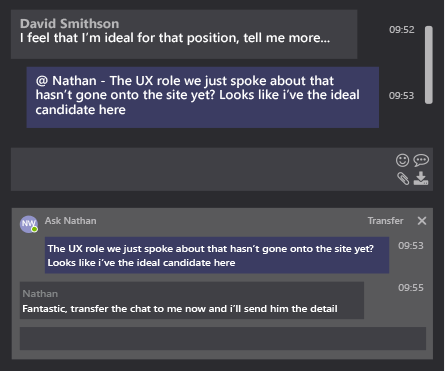 You can even screen candidates in a chat session, for single-channel efficiency. 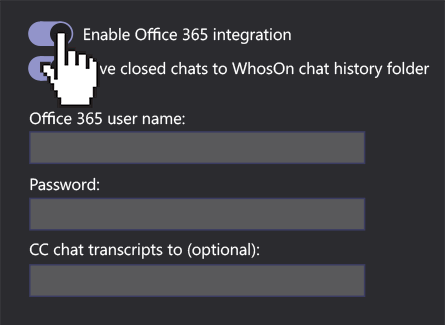 WhosOn integrates with both your CRM and your Office 365 account, which means that scheduling interviews with live chat users couldn’t be easier. You can arrange a suitable time during the session, and share that information with your calendar in a click. 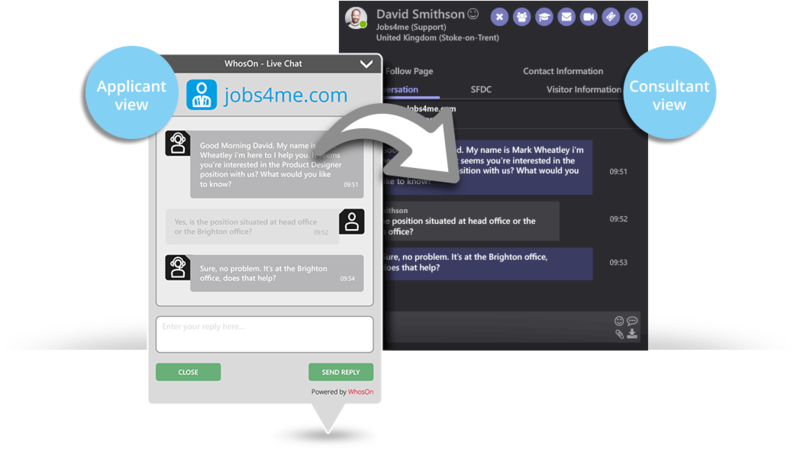 To add further convenience, you can even conduct interviews via your chat solution. Using video capability, you can talk face to face to candidates without leaving the desk. And to review the interview afterwards, all your audio conversations and video recordings are auto-saved. Live chat software feeds your CRM with fresh data day in, day out. Each chat session is packed with valuable candidate information – from contact details to skills to preferences to location. Naturally, you’d like to retain all that data for future use. So, WhosOn offers a rich CRM integration. For you, that means candidate details are added to your CRM alongside chat content, to prevent manual data entry. CVs are synced, leads logged, and records updated – all automatically and out of the box. Looking past candidates, live chat is also a great communication tool for colleagues. A chat solution isn’t just for your website. WhosOn can also be used internally, as an employee instant messaging service. Operator to operator chat encourages collaboration. With it, you can create specific teams or groups, to exchange information and ideas. 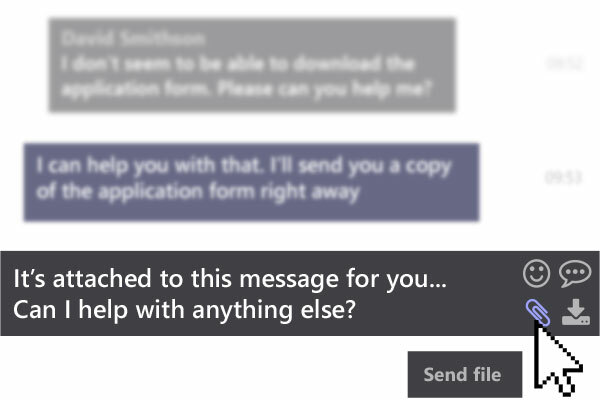 You can send files, ask for help and share news – with all the immediacy and informality inherent to real-time chat. Live chat acts as a language equaliser. Because WhosOn offers real-time language translation in over 40 of the world’s most common languages, it enables people to talk freely and fluently, without communication barriers. Whether you’re chatting to a candidate or colleague, you can do so in their language of choice. WhosOn can detect languages used and auto-translate back and forth. For your HR department, that means inclusive communications, instantly.